In recent months, a coalition of fire victims throughout the state have banded together to fight PG&E, the privately owned utility suspected of causing the fires that destroyed thousands of homes and devastated so many lives in the North Bay. By working together, the UP FROM THE ASHES coalition seeks to collectively shine a light on PG&E and hold the company accountable. California investor-owned utilities, including PG&E, are working furiously at the State Capitol to change state liability laws for damage caused by their equipment. They are lobbying the Governor and State Legislature to take away your constitutionally protected rights as wildfire survivors. So far they have hired five different lobbying firms and have spent almost two million dollars since October 9, 2017. PG&E is an investor-owned utility with incredible power and legal muscle. Now, after causing the Northern California fires, PG&E is seeking: (1) immunity from liability caused by the fires, (2) elimination of property owner’s constitutionally protected inverse condemnation rights, and (3) use of your taxpayer dollars to bail it out. You can help hold PG&E accountable for its equipment and services, and to the people of California that it serves. Please join the UP FROM THE ASHES coalition. 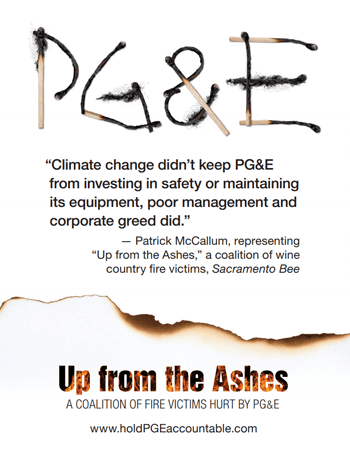 Since it was formed, the ASHES coalition has established a website, placed ads in Northern California newspapers, published a forceful op-ed in the Sacramento Bee, and prompted members to write hundreds of letters to their legislators and other key lawmakers. As a member of the coalition you will be kept up-to-date on PG&E’s legislative actions and receive guidance on how to fight back. The coalition website contains important background information on PG&E and its poor safety record, and provides helpful tools that will allow you to contact your legislators and other key lawmakers about these important issues.